My ninja is more "gen 3" , but this will still work for your bike. This "Active" bracket has the mount for the abs sensor, so no problem there. Ive seen a lot of Japanese pics with this rear caliper swap, but none in english. This is the specific bracket for your bike. Its about 26.00 more than the one I used on my 11-13 bike. No idea what is different, but whatever...odd. No idea what might be different. If you search the site, you will see the 11-13 mount. From there, you need a caliper. Brembo sells a 32mm piston caliper, or a 34mm caliper. I ended up with both. The 32mm has a harder pedal feel. The 34 is softer, but has more power. I think I like the 32mm version with our stock, rear master cylinder. It 140.00, or so from the webike site. Cheaper if you get it from an American site. Shipping is expensive, to the usa, but fast. I think my order took 4 days. I'm not totally sure how this might work with an abs system, but the brake is MUCH better than stock, and looks a hell of a lot better, too. Its damn near impossible to find GOOD, up to date information related to the rear caliper piston size and master cylinder ratios. Im still figuring things out, but so far that 1/2" and 32mm appears to work well. Good feel and smooth power. I already had an aftermarket rear hose, and it worked, after I twisted the caliper fitting. I wish it were 1/2 inch longer, but its ok, for now. Just to clarify - this is the exact one for my gen 4?? Yes, that link I posted appears to be for the z 1000, 14 to 16. I have no idea why it would be different than I have, but it's an extra 30.00. I'd be afraid to try the one I had due to returns being such a pain. The bracket is a well made, precision piece, so I do trust them as far as fit goes. I bought my caliper here: Brembo P32 Brake Caliper. The master cylinder is from a 2008-2010 zx10r. You about have to stay with those years for the 1/2 size as oposed to 14mm. I paid 9.99, on eBay. You could also try our stock 14mm master cylinder we already have on the bike. It worked, but the feel was not quite as nice with the smaller diameter mc. The 14/34 combo felt mushy... ,just what we are trying to get rid of..but was very powerful. It was horrible to bleed. Seriously, I've bled brakes on the car, truck, atv, motorcycles, etc and never had an issue. This was rough. I finally ended up using an air powered bleeder and it was good within 10 seconds...awesome. If I were keeping the stock rear master cylinder, it might work better with that p34 size, 34mm piston. I'm giving you the short version of what I tried. That 1/2" master cylinder and 32mm caliper piston is the closest match I could find to what brembo sells. Brembo pretty much sells only 13mm rear master cylinders. So, the closest I could get to that 13mm, without big money, was the 1/2" (12.7mm) on that specific zx10 series. I hope you do this so we can compare notes. My thought was to dial in the feel, then use brake pads to work with the power level, later on. Yes, I did not remember your front calipers...yes, you HAVE to do this. For anyone following along, and who knows, there might be 1 or 2 people interested. Heck, this forum is available to everyone in the world, right? I get the feeling few ever upgrade their rear brakes based on the info I was able to find..or lack of info, to be more accurate. The stock rear caliper is seriously cheap and heavy. It works, but barely. Vesrah pads help, but theres only so much you can do with a 2.00 dollar design. If you look back to the 1990's era streetbikes, you can see this is one area where they saved money on our bikes. The old calipers were much higher quality. If these calipers were cars, I might have upgraded from Geo Metro up to a Toyota Camry. Comfysofa's HPK calipers are like Ferrari grade, in comparison. 12mm piston diameter should match up well with a 32mm rear caliper. 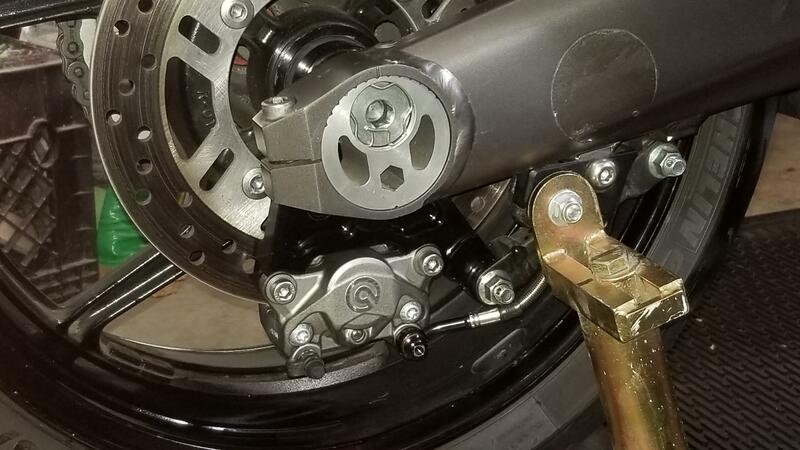 When I switched to the Brembo front master cylinder, and I did not even buy an expensive one. Mines a ducati take off...but, its amazing as compared to what our stock master is. I wonder if the upgraded rear master would be as nice? Interesting. Thanks for that link...ill go for one of those in future (the rear master)....as for the front master...not sure if mine (gen4) is the same as yours. Ill change it if theres an improvment but the braking feel ive got is really good, but, i suppose everything can be improved. And there was me thinking id finished the upgrades..!! I would have followed his advise, but I was not able to find an 11mm master cylinder we could use. The mount spacing was off as compared to what we need. Comfysofa, I know you speak, and write Japanese, so for the love of God, will you please translate this! I like how some of the words are in english. It taunts me into thinking..."Hey, maybe I can figure this out....." LOL anyway, maybe there is soemthing useful here?